A “jack of all trades”, Johannes Zukertort was considered one of the top players in the world. Using his friendship with the great Adolf Anderssen, Zukertort rapidly improve his game and gained worldwide notoriety. Once he reached the pinnacle of his career, Zukertort faced off against the World Champion Steinitz, each betting their entire life savings on the result. The most expensive chess match ever, Zukertort lost the match, his wealth and in the process, his sanity. 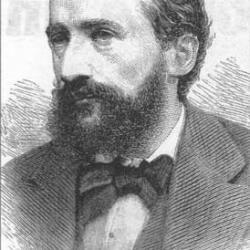 Johannes Zukertort learned to play chess at the advanced age of 19. He did not have a natural ability for the game but refused to stay a total beginner. He became friends with Adolf Anderssen, one of the best players in the world at that time. Zukertort played hundreds of games against Anderssen and honed his skills very quickly in the process. In 1871 he defeated Anderssen in a match and gained respect from the chess world. This led to many opportunities for Zukertort and he eventually got the opportunity to play Steinitz in a match. The conditions of the match were that each side had to put up 400 pounds. This was a lot of money and whoever lost the match would be become bankrupt. Unfortunately Zukertort lost the match and this contributed to his mental breakdown. He was never the same again and passed away on June 20, 1888.